Figure 1c: Normalized absorption at 10 K (open circles) and at 300 K in a-SiO2 (filled circles), at 10 K in c-SiO2 (triangles). Continuous lines were obtained via a Lorentzian fit of each spectrum. Figure 2: Schematic representation of the scattering process of an exciton between well-defined momentum states K1 and K2 by site-to-site disorder-induced fluctuations of the excitonic energy. a) Dispersion diagram of the exciton band, whose half-width B governs the mobility of an exciton; b) The tendency to localization is governed by the root mean square amplitude D of the fluctuations of the exciton energy within the disordered network. When D/B<<1, the delocalized nature of the exciton is prevailing and exciton scattering by disorder-induced fluctuations can be regarded as endowing K states with a finite lifetime. In this situation, the exciton absorption lineshape can be predicted to be Lorentzian due to lifetime broadening of excitonic states. Published as: “Evidence of delocalized excitons in amorphous solids”, Physical Review Letters 105, 116401 (2010). 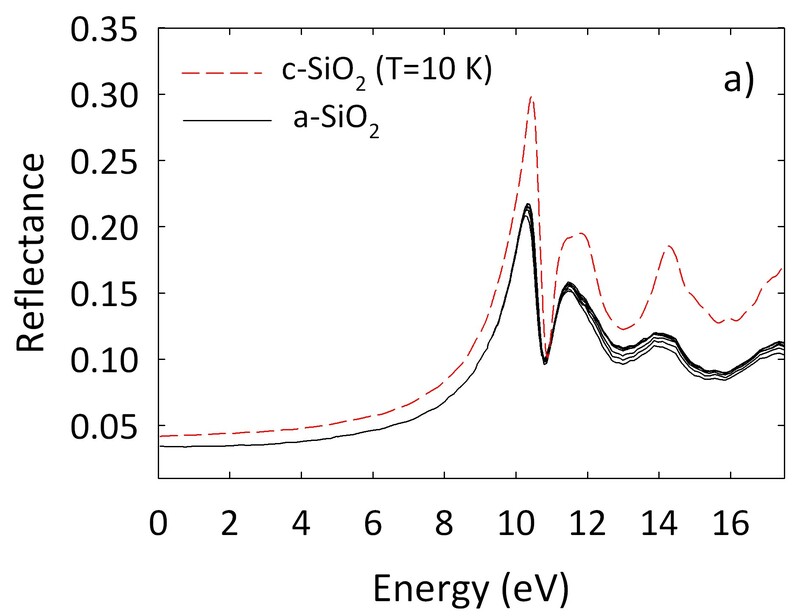 We studied the temperature dependence of the absorption coefficient of amorphous SiO2 near and above the fundamental band gap, as obtained by Kramers-Kronig dispersion analysis of reflectivity spectra. We demonstrate the main excitonic resonance at 10.4 eV to feature a close Lorentzian shape redshifting with increasing temperature. This provides a strong evidence of excitons being almost fully delocalized notwithstanding the structural disorder intrinsic to amorphous SiO2. Since exciton mobility is ultimately related to the translational symmetry of a lattice, this result is remarkable because it shows that, as far as exciton dynamics is concerned, an amorphous solid can actually be “much less disordered” than thought so far. From the microscopic standpoint, a glass can be thought of as a solid where atoms are arranged in a somewhat “disordered” pattern, as opposed to their perfectly regular arrangement in a crystalline lattice. Thoroughly understanding the properties of disordered glassy solids is still a largely open issue in physics. 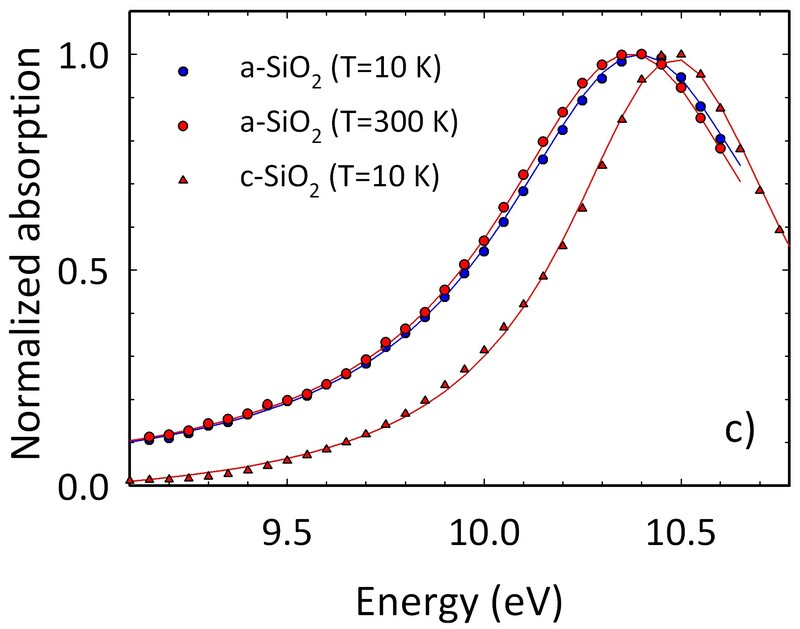 We have recently demonstrated glassy silicon dioxide (a-SiO2) to be surprisingly very similar to crystalline SiO2 (c-SiO2) as far as excitons are concerned. Excitons are neutral elementary excitations, consisting of an electron-hole pair coupled via Coulomb interaction, which can be induced in a solid by absorption of photons. A fundamental feature of excitons is their ability to travel from site to site within the solid, this being an important energy transport mechanism with consequences for optoelectronic devices . However, disorder is known to strongly compromise exciton mobility , in that it breaks site-to-site translational symmetry giving rise to well-defined momentum exciton states. From the experimental point of view, the features of the excitonic absorption spectrum can shed light on the nature of excitons in a material. For wide band gap insulators, of which SiO2 is an archetypal system, the experimental investigation of excitonic absorption is affected by technical complications related to the fact that vacuum UV (<200 nm, VUV) optical technologies are needed. 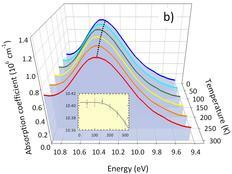 Moreover, in bulk materials, due to the high values of the absorption coefficient involved (106 cm-1), the near-edge excitonic absorption spectrum can be only indirectly inferred by Kramers-Kronig (KK) analysis of reflectivity data . Although straightforward in principle, this approach can be quite tricky due to the need of reliable measurements over a sufficiently extended range, obtained by use of a suitable wide band VUV optical source. This has limited the number of KK investigations on wide band gap insulators, including amorphous and crystalline SiO2, and consequently hindered the comprehensive understanding of several features, even fundamental, of excitons in these systems. We measured reflectivity R(E) in the range from 8 to 22.5 eV of both crystalline and amorphous SiO2 samples at the SUPERLUMI experimental station (beamline I, DORIS III). The use of synchrotron light as excitation source for reflectivity measurements allows for an enhancement of the quality of the spectra with respect to other traditional VUV radiation sources, due to improved intensity and stability properties. In order to extract the absorption coefficient spectra, we then performed standard KK dispersion analysis on R(E) spectra . Fig. 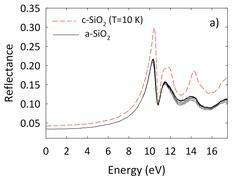 1(a) shows the reflectivity spectra of a-SiO2 from 10 to 300 K and that of c-SiO2 at 10 K, whereas in Fig. 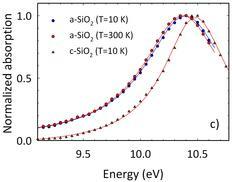 1(b) the temperature dependence of the KK derived absorption peak at 10.4 eV in a-SiO2 is reported. This peak is known to be an excitonic transition: as evident from Fig. 1(b), it redshifts with increasing temperature while its amplitude slightly decreases. Well established theoretical models describe the broadening of an exciton resonance in a crystal as resulting from excitonphonon coupling and the excitonic line shape as arising from the competition between mobility of excitons and thermal fluctuations of their energy . The accuracy of our measurements allowed an unprecedented characterization of the 10.4 eV peak, leading to unanticipated insights on the physics of excitons in a-SiO2. We demonstrated this resonance to have a remarkably good Lorentzian line shape at all the examined temperatures. Fig. 1(c) presents the normalized 10.4 eV peak of a-SiO2 at 10 and 300 K and that of c-SiO2 at 10 K, together with Lorentzian best fit curves: the agreement with experimental data is remarkably close. This result shows that the description normally used for crystalline systems can be adopted also for amorphous ones. Most importantly, based on the very general theoretical arguments suggesting Lorentzian absorption line shapes being expected when mobility effects (B) prevail over energy fluctuations (D) (see Fig. 2) , our data demonstrate that excitons in glassy SiO2 are basically as mobile as they are in crystalline SiO2, notwithstanding disorder. It turns out that glassy disorder influences exciton mobility even less than thermal fluctuations. This unexpected finding sheds new light on our comprehension of the elusive glassy state of matter, strongly suggesting that glassy SiO2 is actually “much less disordered” than thought so far. G. D. Scholes and G. Rumbles, "Exitons in nanoscale systems", Nature Mater. 5, 683 (2006). 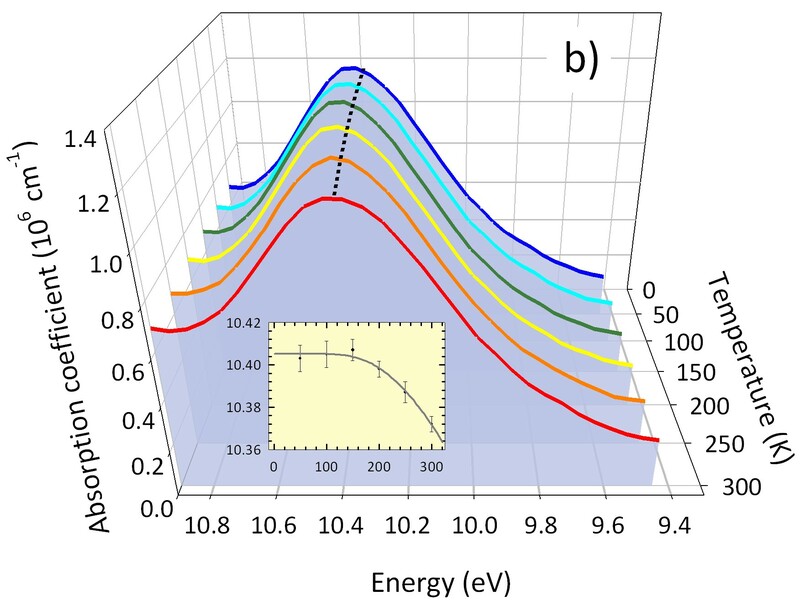 S. M. Vlaming, V. A. Malyshev, and J. Knoester, "Localization properties of one-dimensional Frenkel excitons: Gaussian versus Lorentzian diagonal disorder", Phys. Rev. B 79, 205121 (2009). G. L. Tan, M. F. Lemon, D. J. Jones, and R. H. French, "Optical properties and London dispersion interaction of amorphous and crystalline SiO2 determined by vacuum ultraviolet spectroscopy and spectroscopic ellipsometry", Phys. Rev. B 72, 205117 (2005). Y. Toyozawa, "Theory of Line-Shapes of the Exciton Absorption Bands", Progr. Theor. Phys. 20, 53 (1958).